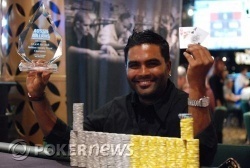 Congratulations to Marlon Goonawardne, Event #6 Champion! "I did this for all the $2-5 donks out there!" said Marlon Goonawardne as he posed for his winners photo, hoisting his winning A-Q aloft. Goonawardne is a popular local player at the Crown Casino who plays $2-5 NL. It seemed like everyone in the casino wandered away from their tables to congratulate him and shake his hand after he won. Goonawardne seized the chip lead on the second hand of play when he eliminated Kim Pearl and never had to look back. Despite some serious competition from 2006 WSOP Main Event 3rd place finisher Binger, Goonawardne never backed down and rode that big stack all the way to victory. Congrats to Marlon Goonawardne on a match well played. Maybe now it's time to move up to the $5-10 game? Michael Binger moved all in for 105,000 pre-flop and Marlon Goonawardne made the call. The board ran out and Goonawardne dealt Binger the knockout punch after a hard-fought heads up battle. Binger earns $88,060 for his runner-up finish. Congratulations to local favorite Marlon Goonawardne, who not only claims Binger's $1,000 bounty, but takes home $155,400 for his victory. Michael Binger's frustration is beginning to show. 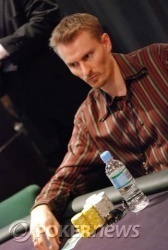 After a pre-flop min-raise from Goodawarne, Binger peeked at his cards and then mucked them in disgust. Goodawarne showed . "Don't get comfortable... he's a strong player. Be careful!" cautioned one of Goodawarne's friends on the rail. Binger is now down to 110,000 vs. Goodawarne's 1,740,000. Goonawardne raised to 24,000 and Binger called. The flop was . Binger checked, Goonawardne bet 15,000 and Binger called. The turn was the and both players checked. The river was the . Binger bet 35,000, Goonawardne min-raised to 70,000 and Binger folded. 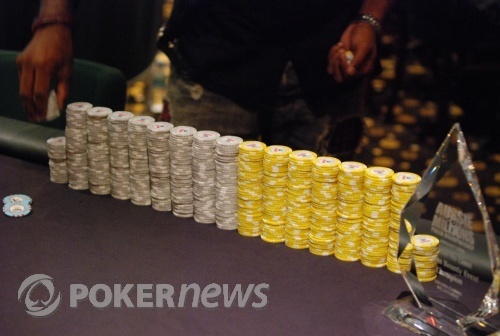 Binger's stack fell to 185,000 on the hand. Clonie Gowen has joined Michael Binger's fans on the rail, including John Murphy, Roy Winston, and his brother Nick. She's decked out in a black and white ruffled babydoll dress that reminds this reporter of a French maid's outfit. What's up with that?? Marlon Goonawardne and Michael Binger both limped in and saw a flop of . Goonawardne check-called a 16,000 bet from Binger on the flop. The turn was the . Goonawardne fired out 25,000, Binger raised to 60,000, and Goonawardne re-raised to 140,000. Time was called on Binger as he tanked, and he finally folded his cards. After the hand, Binger was down to 255,000. On a flop of , both Goodawarne and Binger checked. The turn was the . Binger checked, Goodawarne bet 20,000 and Binger called. The river was the . Binger checked, Goodawarne bet 25,000 and Binger called. Goodawarne showed and took it down with a pair of aces. After the hand, Binger was down to 320,000.